The Godfather is back! 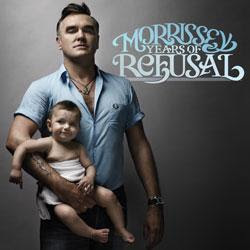 Morrissey will be releasing his new studio album 'Years of Refusal' February the 17th in the U.S. The first single from the album will be 'I'm Throwing My Arms Around Paris' which is being released one week prior to the album. Of course it's all over the internet already. Did you expect anything less from his obsessive fans? Although I'm not as big of a fan as I used to be, I still have immense respect for him. His music with The Smiths and his first solo albums helped shape who I am today. Vauxhall and I has to be one of my favorite all time records! It still sounds just as fresh today as when it was released back in 1994. Hard to believe 15 years have passed so quickly. He's calling the new single 'a cosmopolitan hymn to architecture'. My favorite band of all time is the Smiths and I go see Morrissey everytime he comes to town! I see he is touring the U.S. but no South Florida stop?!?!?! He still owes us for canceling the last concert! good song, not great. hopefully with bush gone he'll quit the political rhetoric that has been prominent in his last two albums and return to the subtlety,nuance, and irony of his prior efforts. or maybe something new? He's performing at Mizner Park on Saturday, February the 28th @ 8PM. Tickets on sale the 16th of January. It's a Live Nation Show. I agree not my favorite Morrissey track, but wanna hear whole album before making any final judgements. I hope he tries to push his boundaries a bit and maybe try some new things on this new one.